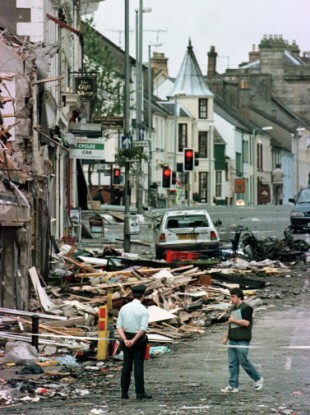 The scene of devastation in Omagh following the bombing in 1998. RELATIVES OF PEOPLE killed in the Omagh bombing are now alleged to have been among those who had their phones illegally hacked. The Belfast Telegraph reports that two families who lost their relatives in the Omagh attack told the paper they were concerned their phones had been hacked by the NOTW. They are Victor Barker, whose son James died in the Co Tyrone town in August 1998, and Michael Gallagher, whose son Aidan died in the same attack. However Metropolitan Police are not commenting on individuals who may have been hacked. These are the latest names emerging in the hacking scandal, with the Guardian reporting that police say they are investigating more than 4,000 potential victims. Prime Minister David Cameron is to call a press conference on the hacking scandal later today, RTE’s Morning Ireland reported this morning. Former editor of the NOTW, Andy Coulson, is expected to be arrested today by British police investigating the hacking allegations. Coulson resigned as Cameron’s director of communications over the hacking investigation at the start of this year. Alleged victims of the NOTW hacking include MP Ian Paisley Jnr, actress Sienna Miller, soccer star Ryan Giggs, actor Jude Law, Tony Blair, Prince William, George Michael, and Eric Clapton. Yesterday evening it was announced that the last issue of the News of the World will be printed this weekend. Email “Relatives of Omagh victims may have been hacked by NOTW”. Feedback on “Relatives of Omagh victims may have been hacked by NOTW”.